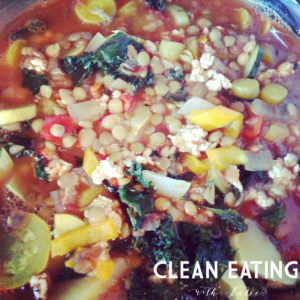 This is the FINAL post for The 52 New Foods Challenge! WOW! It has taken me MUCH longer that 52 weeks to blog about this, but hey, I stuck with it!! Pomegranates are a fruit that I didn’t really eat until I was an adult. I loved buying the ready-to-go pomegranate seeds at Trader Joe’s! So easy! 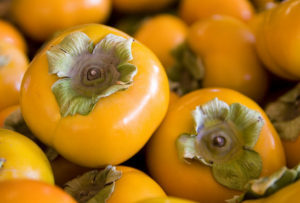 They are quite a fun snack, although they are a bit of work when you buy the whole fruit. I also enjoy adding pomegranates to salads. The seasonal Thanksgiving salad that I mentioned here, also had pomegranate seeds. 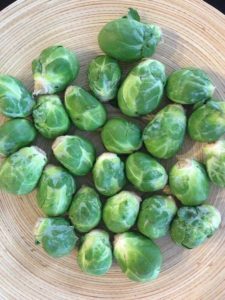 Danielle Walker of Against All Grain adds them to a Brussels sprouts dish, which adds a delightful twist. Jennifer Tyler Lee suggests making a sauce using pomegranates instead of cranberries or add them to a wild rice and pistachio dish. Both sound delicious! 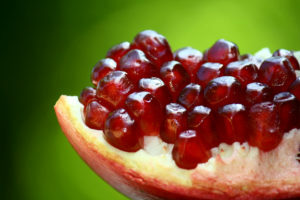 Pomegranates are thought to be the forbidden fruit in the Garden of Eden, rather than apples. The red seeds are called arils. Pomegranates are a good source of vitamins K, E, and B6, and folate, potassium, manganese, and pantothenic acid. 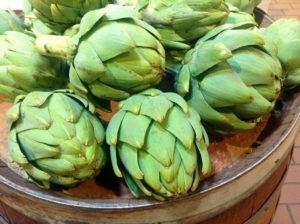 Rich source of antioxidants, especially tannins and flavonoids. Studies show that pomegranate juice can inhibit the growth of breast, prostate, colon, and lung cancers. Pomegranates have been shown to be heart protective, as it can improve blood pressure and improve blood flow. The 52 New Foods Challenge by Jennifer Tyler Lee and Superfoods by Tonia Reinhard. 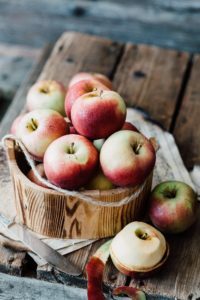 While Apples are pretty much a staple in most homes in North America, I imagine that there are many varieties that you have yet to try! My grandparents had an apple tree in their backyard and I grew making apple crumbles and apple pies with my grandma. Despite all those apples as a kid, I did not really like raw apples until I was an adult. Green were too tart for me and red and yellow were always too mealy (I now know that’s because they were OLD – many months out of season). 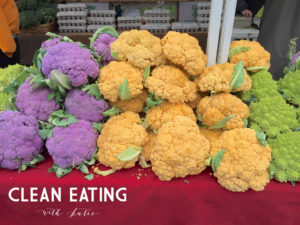 Americans are so used to getting all types of produce year round in super markets, but in reality, those foods are either stored in cold storage for many months, grown in a different climate and shipped in, or grown in a greenhouse. As an adult, I have come to really like all kinds of pink apples: pink lady, fuji, gala, and honeycrisp. I also only eat apples during apple season and during the very early weeks of cold storage. In Northern California, apple season begins in mid-late July and generally lasts until October. Thus, I only consume apples from July-December. Besides eating apples with almond butter, my favorite thing to use apples for is apple pie, any surprises there??? Jennifer Tyler Lee recommends that folks make an apple galette, warm cinnamon apples, or apple chips. Wild apples have SIGNIFICANTLY more phytonutrients than our domesticated varieties – some wild varieties have up to 475 times more phytonutrients than certain domesticated varieties. If you were to plant the five apple seeds from an apple, you would get FIVE different varieties from those new trees. Once a variety is identified, new trees are grown by grafting (a method that involves cutting off branches from a tree and attaching that branch to a less desirable tree that has been trimmed back). This is known as extreme heterozygosity. Any apple that is less than two inches in diameter is considered a crabapple. Most of our modern apples can be traced back to central Asia. There were once 15,000 varieties of apples growing in the United States, now there 500 varieties. Apples harvested at the end of apple season will store the longest – several months, as compared with apples harvested in the beginning of apple season – several weeks. Apples store best in the crisper drawer of your refrigerator. An apple with the peel contains 50% more nutrients than an apple without the peel. Raw apples contain more nutrients than cooked apples. Apples are a good source of vitamins C and K and potassium. Good source of pectin and other fibers. The first time I bought a butternut squash, I had no idea what to do with. I found a recipe in my Clean Food cookbook for roasted butternut squash with almonds and a touch of maple syrup. It was exciting to try new a food and a new recipe and really like it! The next week, at the farmer’s market, I went back for more butternut squash. This time I found a recipe for butternut squash soup. I’ve been hooked ever since! Here’s my favorite Butternut Squash Soup Recipe. 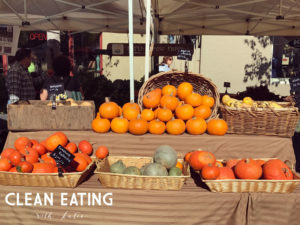 Jennifer Tyler Lee also suggests butternut squash soup and a maple roasted butternut squash. Yum! 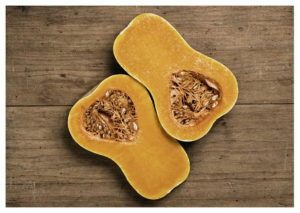 Because of the thick skin, winter squashes, like butternut squash, can last in cold storage for up to six months. 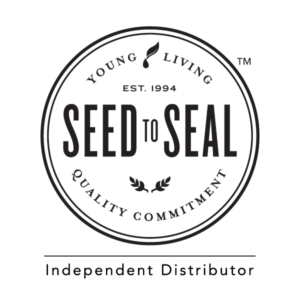 Encyclopedia of Healing Foods by Michael Murray, Joseph Pizzorno, and Lara Pizzorno, Superfoods by Tonia Reinhard, and The 52 New Foods Challenge by Jennifer Tyler Lee. Carrots are generally quite the crowd pleaser for kids and adults alike. Although I can imagine that it could be tricky to get kids to eat rainbow carrots. I have always liked carrots raw but only recently in the last few years have I really learned to love roasted carrots too. Jennifer Tyler Lee also recommends roasted carrots, but she also recommends a fresh carrot salad which also sounds delicious! The ancestors of our modern carrots came from Afghanistan and were purple. During the cultivation of carrots, two mutant varieties began appearing – white and yellow. Orange carrots were not seen until 400 years ago when breeders crossed a red and yellow carrots. Purple carrots contain nearly TWENTY times the amount of phytonutrients as orange carrots. Carrots are sweetest and freshest when the green tops are still attached. However, if you do not plan on using the carrots within a day or two of purchase, remove the tops, as the carrots will remain firm and fresh longer. They will also retain their moisture longer. Frozen carrots are not as nutritious as fresh carrots. Carrots are more nutritious when cooked!! 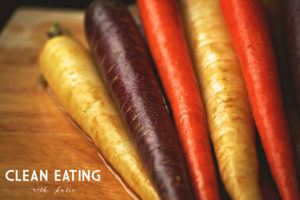 Sautéing or steaming carrots retains more nutrients than boiling carrots. Whole cooked carrots contain more cancer-fighting compounds called falcarinol than carrots that have been cut before cooking. Eat carrots with some fat! Carrots are rich in beta-carotene, which is a fat-soluble vitamin. Carrots have a low respiration rate. The anthocyanins in purple carrots have been shown to support a healthy liver in rodent studies. Good source of vitamins K, C, and B6, potassium, thiamine, and biotin. The 52 New Foods Challenge by Jennifer Tyler Lee, Encyclopedia of Healing Foods by Michael Murray, Joseph Pizzorno, and Lara Pizzorno, and Eating on the Wild Side by Jo Robinson. 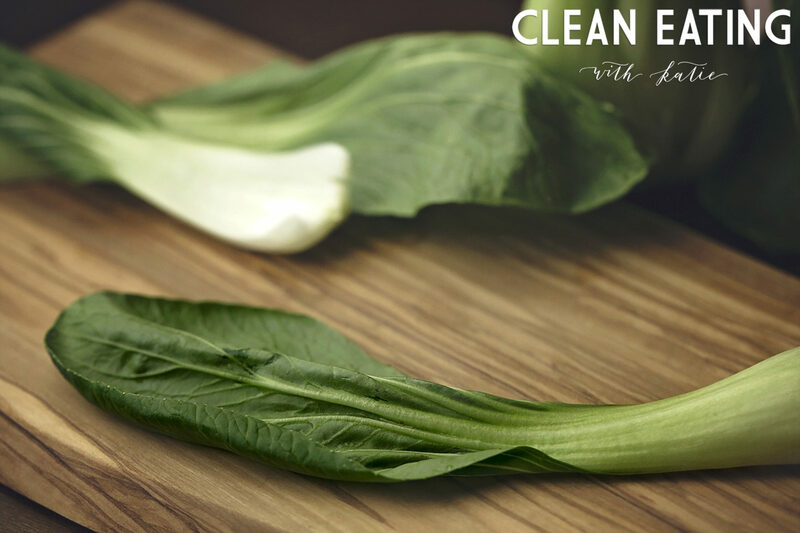 This soup was created with liver health in mind. Midway through my chemotherapy treatment for Breast Cancer, my liver enzymes were too elevated to continue treatment. We had to postpone treatment for at least one week to make sure that my liver was healthy enough to process the chemotherapy. At that time I was in school to become a Nutrition Consultant and I knew there were things that I could do to “Love my Liver”, so I went home and made some BIG changes to my diet for that week and well, IT WORKED! I went back the next week and my enzyme levels were low enough to continue with chemotherapy. Here is one of the recipes that I made for the “Love my Liver” week. Rinse lentils and let soak overnight. Next day: in a large pot, sauté onions and garlic in butter. Add broth, tomatoes, lentils, and veggies. Add ground turkey. Bring to a boil and then reduce to simmer. Continue simmering for 30-45 min.